The CW has canceled its new medical drama “Emily Owens, MD,” but aired all 13 episodes that were produced. Brittany Ishibashi as Dr. Kelly Hamata. The series, which premiered in October, starred Mamie Gummer (Meryl Streep’s daughter), Justin Hartley, Aja Naomi King, Michael Rady, Necar Zadegan and Kelly McCreary. The ratings-challenged show’s final episode aired in February. Yoshie Bancroft appeared as Nurse Sunny in nine episodes and Brittany Ishibashi played Dr. Kelly Hamata in five episodes. Ishibashi’s character was the ex-girlfriend of Rady’s character, Micah Barnes. 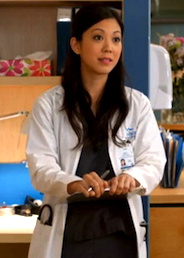 Other recurring actors during the brief run of “Emily Owens” included Ian Anthony Dale (“The Event,” “Hawaii Five-0”) as Dr. Kyle Putnam (two episodes); Hiro Kanagawa (“Arrow,” “Bates Motel”) as Dr. Balian (two episodes); Benita Ha (“Underworld: Awakening”) as an anesthesiologist (three episodes); and Theresa Wong (“Grass Roots”) as an O.R. nurse (two episodes). The last five episodes can still be viewed on Hulu as of Thursday.